Today’s post on Mastication Monologues is one of my sweetest and over the top posts I’ve ever written! If you have a sweet tooth that borderlines on a diabetic condition like I do, then you’re going to love this entry. 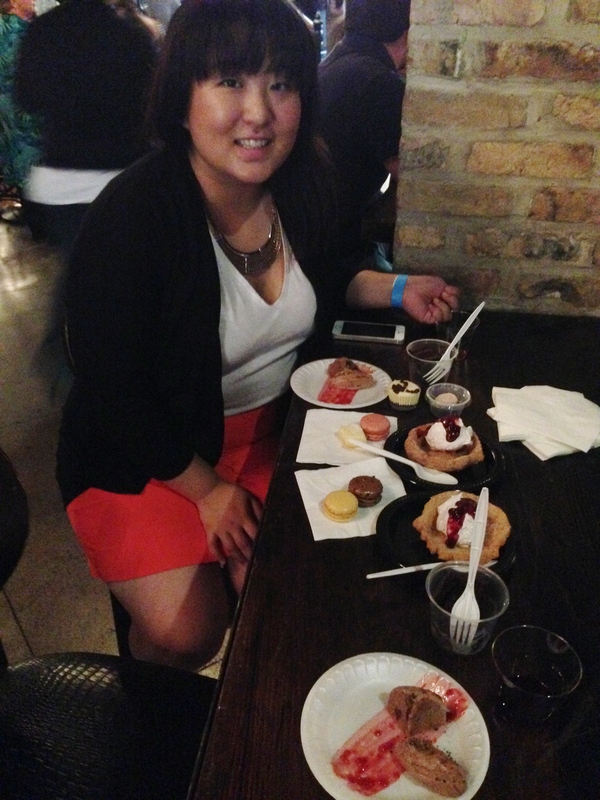 Last weekend, Janice and I experienced the final part of my one year anniversary gift that she got for me: two tickets to Chicago’s Dessert Fest. What a sweetheart! 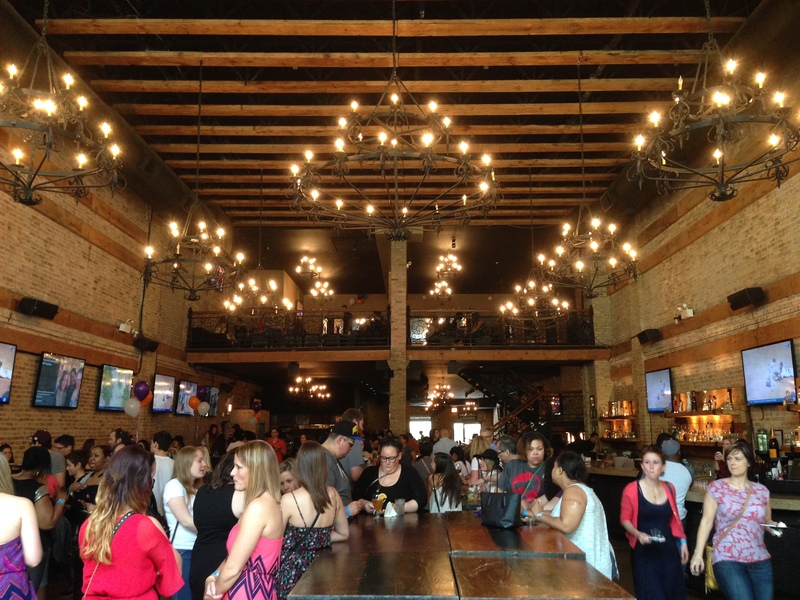 When we got to the venue, River North’s John Barleycorn and Moe’s Cantina, there was already a line out the door and an accompanying mob once we got inside. 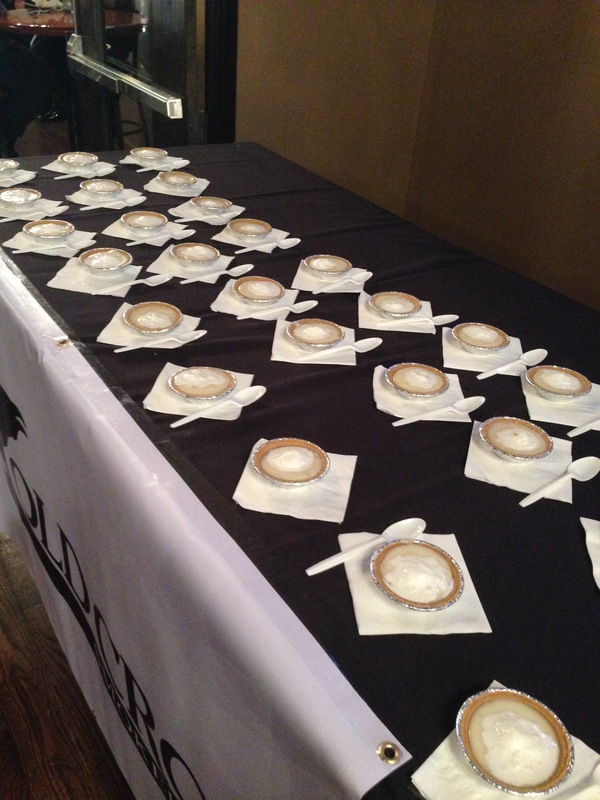 Everywhere we looked, we could see plenty of delicious treats being enjoyed by the guests. 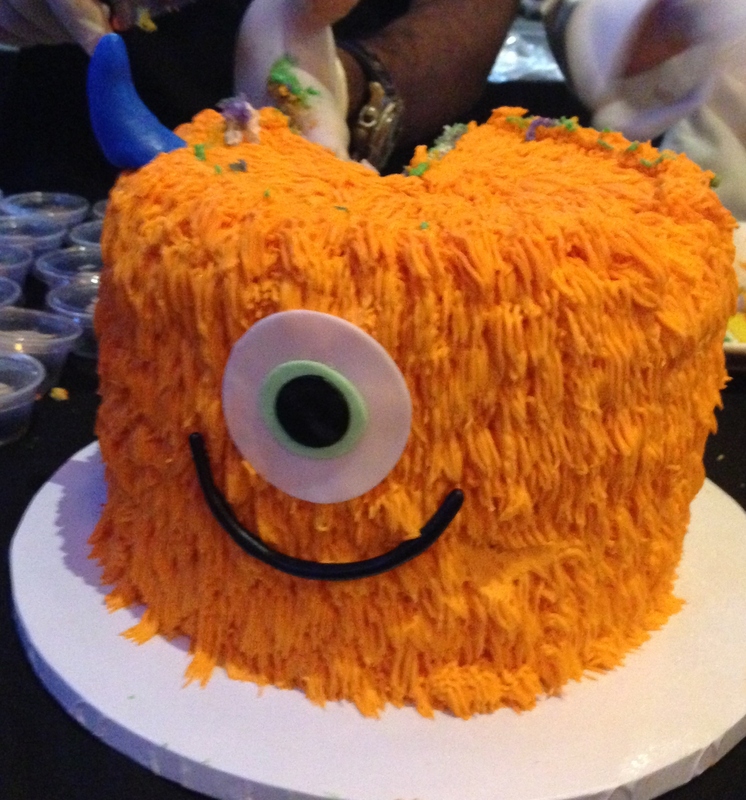 While we weren’t swayed by the sundae bar that seemed pretty weak for an epic event like this one, we were more interested in the cake table with desserts made from Fabiana’s Bakery. 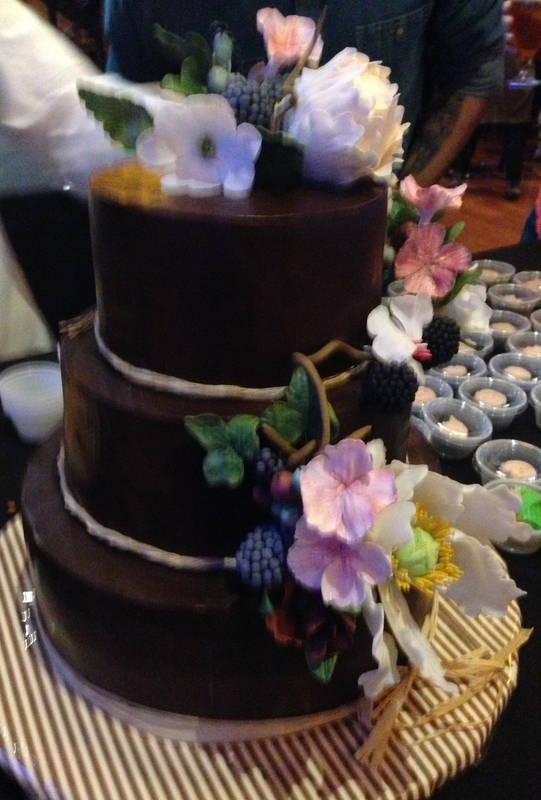 Not only did it boast a wonderfully delicious, buttercream-coated, cyclops rainbow cake that won “Most Craveable Dessert” but also a decadent chocolate ganache wedding cake served in plastic shotglasses. 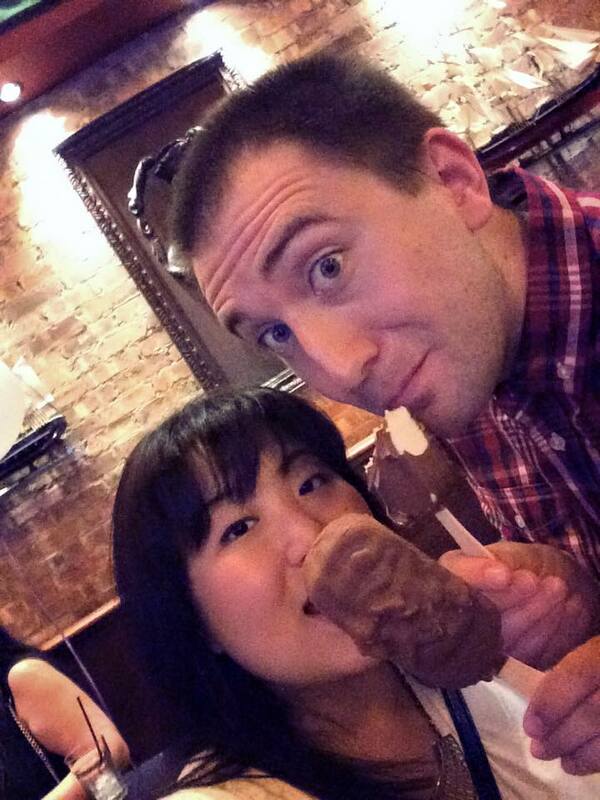 We definitely got crunk on those nuggets of rich dark chocolate goodness. We quickly moved our ways through the munching masses and were confronted with a barker of sorts who bellowed, “WHO WANTS FREE ICE CREAM?!! 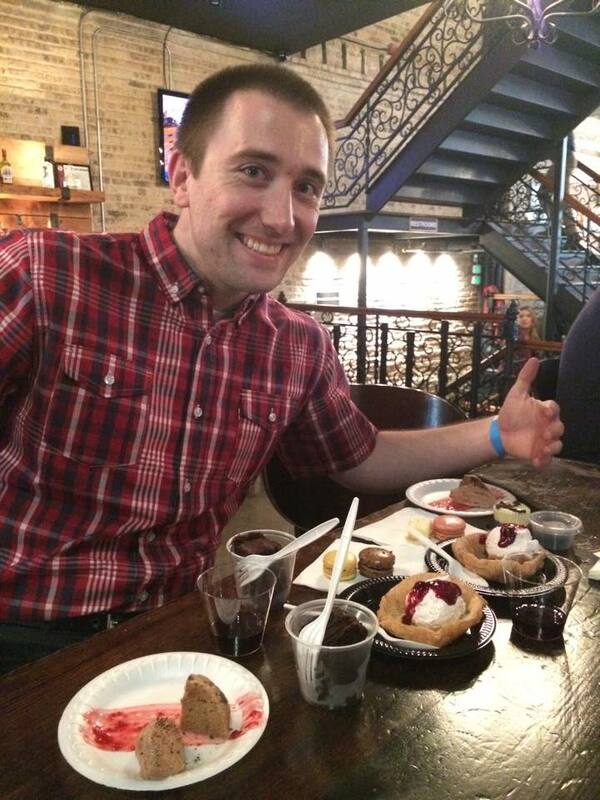 THIS IS DESSERT FEST!!! !” I didn’t know King Leonidas worked dessert fairs in his spare time. Naturally, Janice’s and my hands shot up because we’re all about the cold stuff. 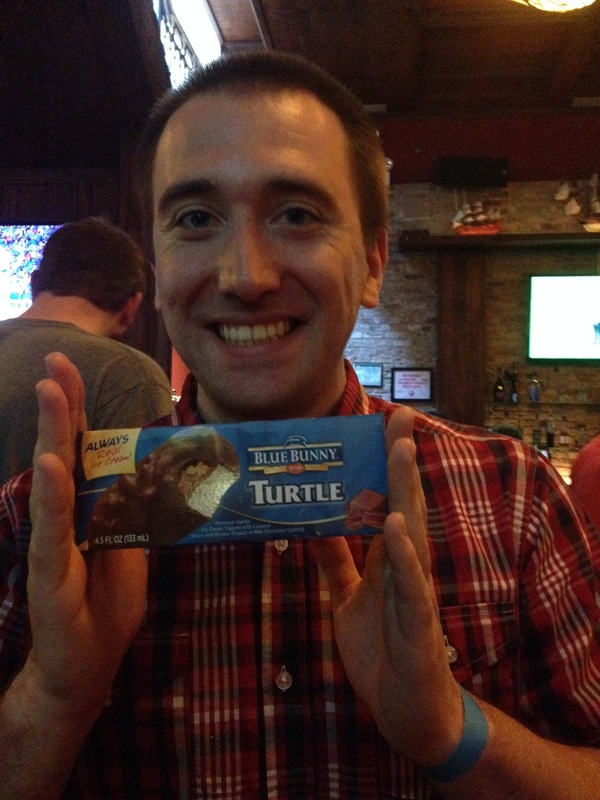 He hooked us up with free Blue Bunny turtle bars that was a combo of pure vanilla ice cream coated in a crunchy milk chocolate shell with the occasional hunk of pecans and caramel. Simply the best, bar none! 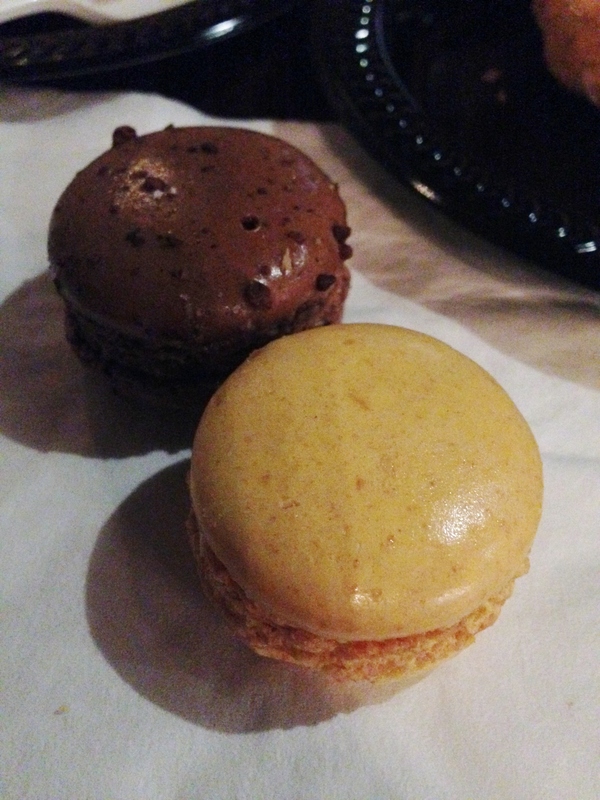 We managed to snag a sample of macarons from a table that was mobbed with people. I snapped up a chocolate one and a passion fruit one while Janice got a raspberry one. They were perfect from their semi-sticky middles to the airy yet firm cookies. I personally felt the raspberry combined with the chocolate one was the ideal combination, but the passion fruit was a bland letdown. 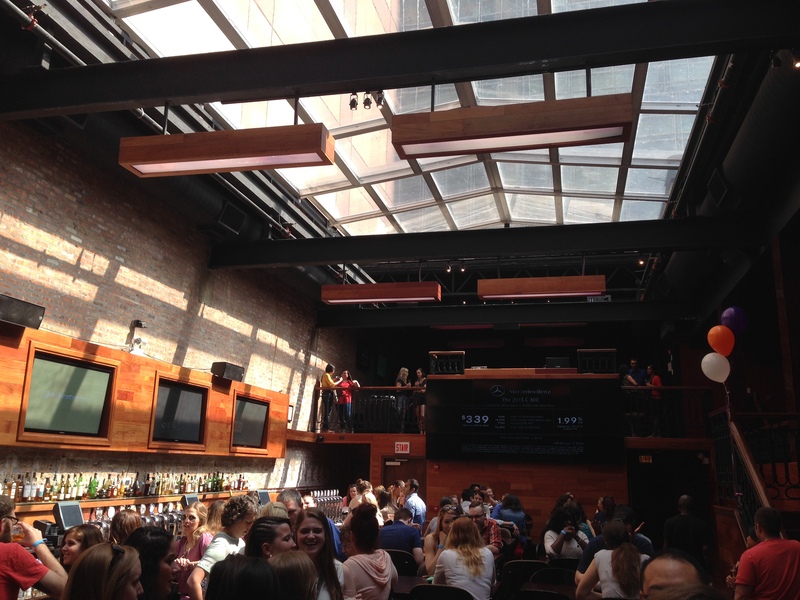 We made our way upstairs to the sun-splashed second floor of John Barleycorn where they were slinging champagne and white wine with banana creme pie samples. I got a glass of bubbly while Janice and I shared a nibble looking out over the crowd by the bar while lounging on a leather couch. The banana creme pie reminded us of a pina colada with a mix of coconut and cream, but the champagne made it even better. We made our way down and over to Moe’s Cantina where an entire room was just waiting for me to be explored. Right by the entrance, they had an open kitchen where I saw cooks preparing some sort of cup dessert with cream. I didn’t have time to spare. I was on a mission. I visited each booth and brought back my loot to our table. What a spread we had once I was done doing my recon mission. What we ended up with was a slice of Bar Louie’s chocolate cake, voted “Most Delicious Dessert”, but sadly we never tried it since we filled up on the following treats beforehand. First, there was the Warm Belly Bakery entry that eventually was crowned the Chocolate Champion. 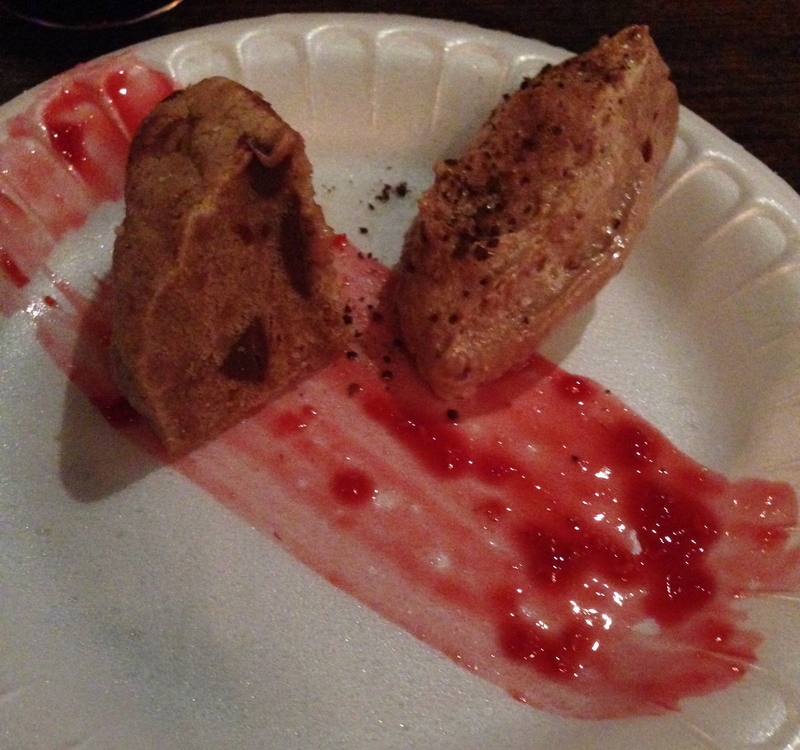 Its presentation left much to be desired, but the brown butter chocolate chip cookies with a salted hazelnut dark chocolate mousse and a raspberry accent was quite a combo. The cookie seemed a bit undercooked but the rich buttery dough and sweet chocolate combined to perfection with the salty yet earthy mousse. The raspberry reminded me of our earlier macaron experiment. While the fruit and chocolate combo was seemingly going to rule the day, the mystery dessert I had witnessed a few minutes earlier ended up rocking my world. Turns out it is a Mexican dessert from Moe’s Cantina called a crispy xango (pronounced “zan-go”with berries and cream. 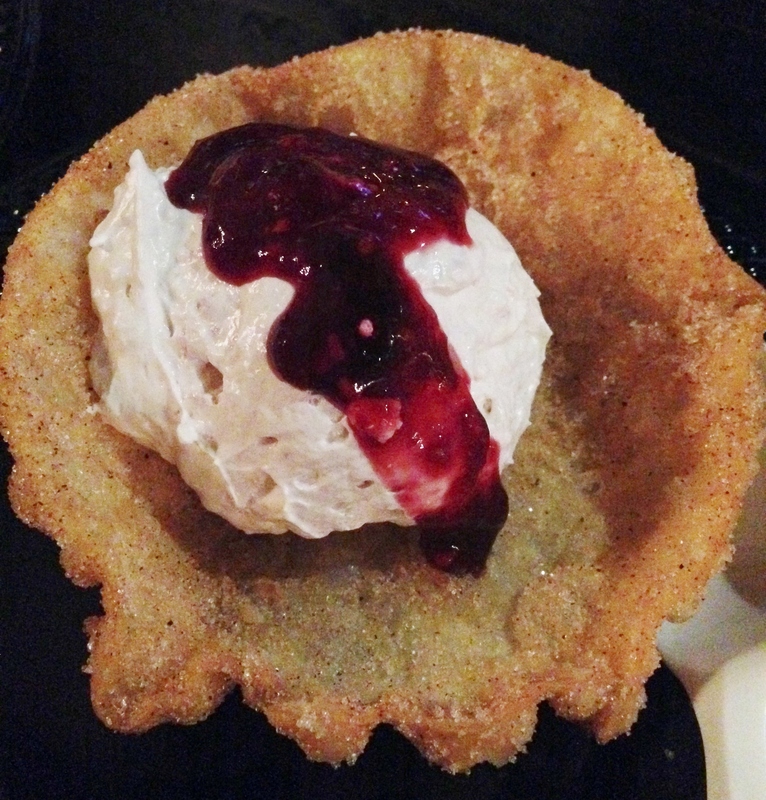 What is consisted of was a deep fried tortilla, coated in cinnamon and sugar churro style, and filled with a berry infused cream. Janice got even more of the lowdown from one the employees. Turns out they import their tortillas from Nuevo Leon in Mexico, and the cream even had a slight Bailey’s infusion to the cream. 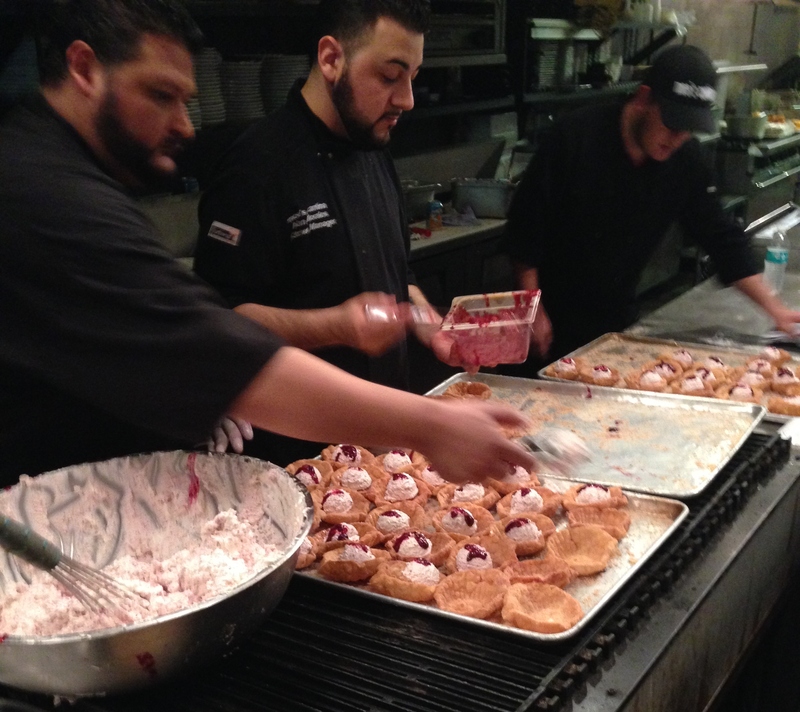 Deep fried treats and a boozy sweet element? I’ll take it! I spread the cream evenly over the crunchy and crumbly surface like butter, and it was an ideal combo of textures and flavors. 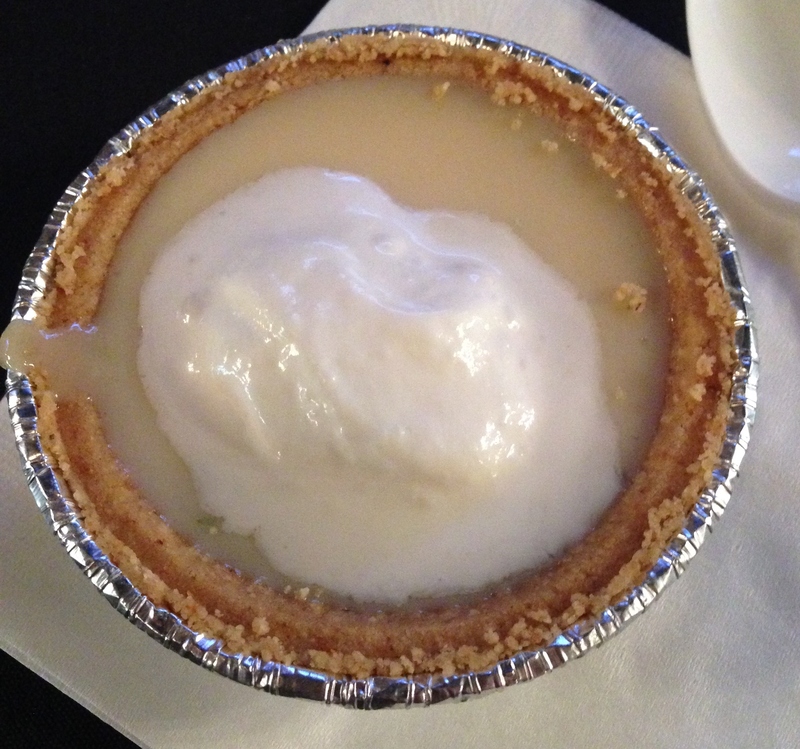 By the time we made our ways upstairs, we walked past Old Crow Smokehouse’s plethora of key lime pies, which were given the “Perfected Classic Award”. We didn’t sample any, but we did get a taste of some after-dinner digestifs. Digestif is a term from French that refers to a drink that supposedly aids digestion. The ones we samples were of an Italian variety in the shape of an amaro and a limoncello. The former is an herbal liqueur that is often consumed neat, and has roots in the 19th century often originating in pharmacies or monasteries. The name “amaro” means “bitter” in Italian, and I could see why. I could only liken the taste of it to a less syrupy/obnoxious Jaegermeister. It was potent but bursting with anise, ginger, and licorice. As for the limoncello that Janice tried, it is a very different digestif compared to the amaro. First, it is a bright yellow that comes from the lemon zests (hence the name) that are used to make the alcohol. Second, it is more regional in nature given that it is a mainly southern Italian drink. The one we had came from the southeastern region of Italy called Abruzzo which is kind of close to the heel of the boot of the peninsula. Tastewise, it cleansed the palate of all of the sugar we had previously consumed but also perked us up with a strong, lemon scented kick. As we left the festival, it was like leaving some sort of wonderful, Willy Wonka-esque type of dream, but it was a great gift from my lovely girlfriend. I highly recommend it if you’re looking for a good and calories-be-damned sort of time! Posted in Bakery, Cake, Chocolate, Cookies, Desserts, Pastries, Pie and tagged cake, champagne, Chicago, Chips, chocolate, churro, cookies, dessert, fest, frosting, fruit, macaron, river north, tortillas, wine. Bookmark the permalink. Hey hey hey, everybody! It’s almost the end of October already, and I’m definitely in the Halloween spirit. I do miss the changing leaves, football, and apple cider, but tonight I had a legit taste of home to kick-off my Halloween weekend. Although tacos aren’t really known for being synonymous with Halloween, the ones I had at Gusto Taco were frighteningly good. 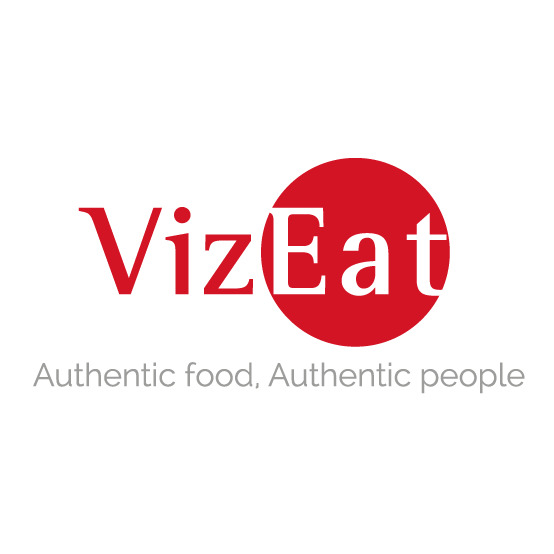 Here’s their website. If you’re going there by metro, get off at Sangsu, and come out exit 1. Make a U-turn to your right when you come out, and walk down the street for two minutes. You’ll see it on your left. Growing up in Chicago, I’ve had my fair share of Mexican cuisine, and I’ve chronicled it in a few of my posts (See Salsa and Nopales). 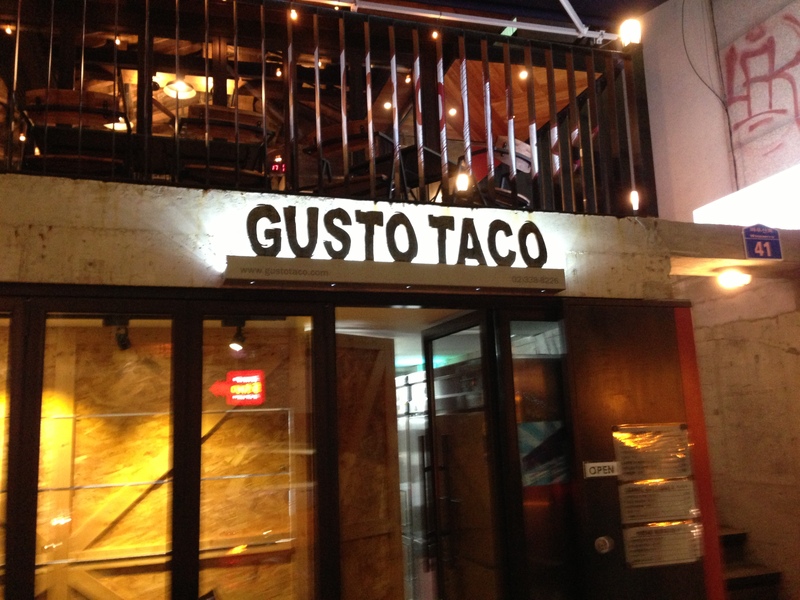 Therefore, I was somewhat skeptical when all of my friends were raving that Gusto Taco had the best tacos they’ve every tried in their lives. So when we walked in, it was a pretty basic looking place with close to no one inside. I went for the pork chipotle tacos and the pollo asada (grilled chicken) tacos. 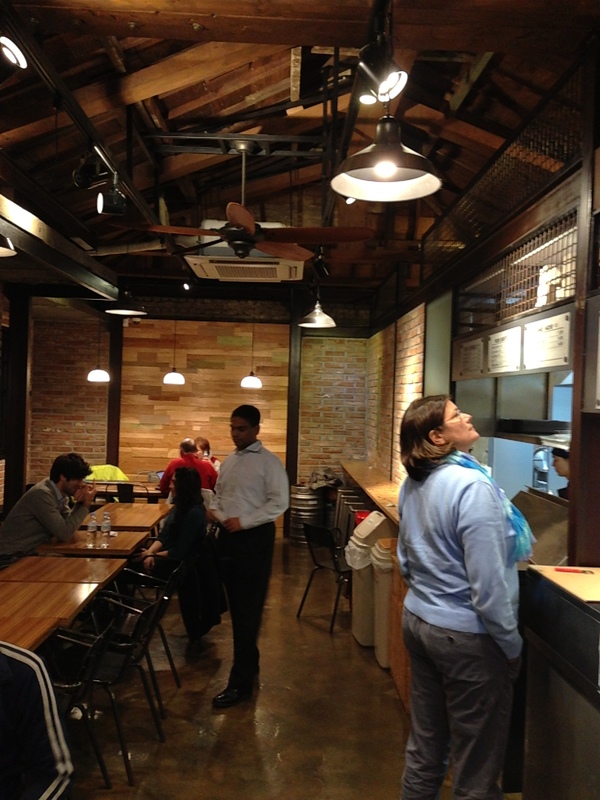 There are two tacos to each order, and the price range of tacos goes from 5,700 Won to 8,000 for the shrimp tacos. They’re moderately sized, but I would soon find out that the flavors packed into them were larger than life. They also have burritos, nachos, and quesadillas if you aren’t feeling like a taco fiesta is for you. 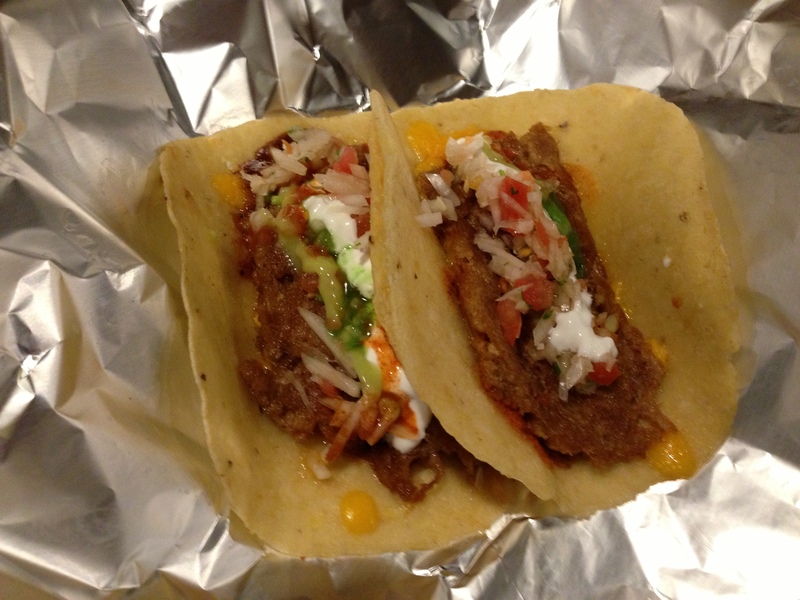 First, there were the chipotle pork tacos which everyone in my group recommended. Looking at the various ingredients in the taco like the pico de gallo, sour cream, guacamole, and a light spritz of tomatillo salsa, I could see that these tacos were something special. After the first bite, I could now see why my friends were acting like these tacos were the crystal meth of foreign foodstuffs. My friend, Danielle, who was with me, asked the Walter White or perhaps the Jesse of the operation, in reality a small Korean woman, if they made their own tortillas. Turns out that they do, and they were the best corn tortillas I’ve ever tasted. Not only did they have that slightly oily corn character to every bite, but they were extremely resilient amid my own personal feeding frenzy. When the guacamole hit the water, I went full-on Jaws on those pork tacos. As for the meat, it was a strange yet refreshing fusion of typical Mexican pork with an almost gyro-esque texture but with a bit less grease. However, I don’t know quite where the cilantro comes in since I couldn’t really taste any of it aside from in the pico de gallo. I was thinking that there would be perhaps some sort of cilantro rub or the like on the meat. Just make sure you’re ready to get your hands a bit dirty with grease/juices while eating them. They also go great with a splash or two of the complimentary Tabasco hot sauce Gusto Taco provides. 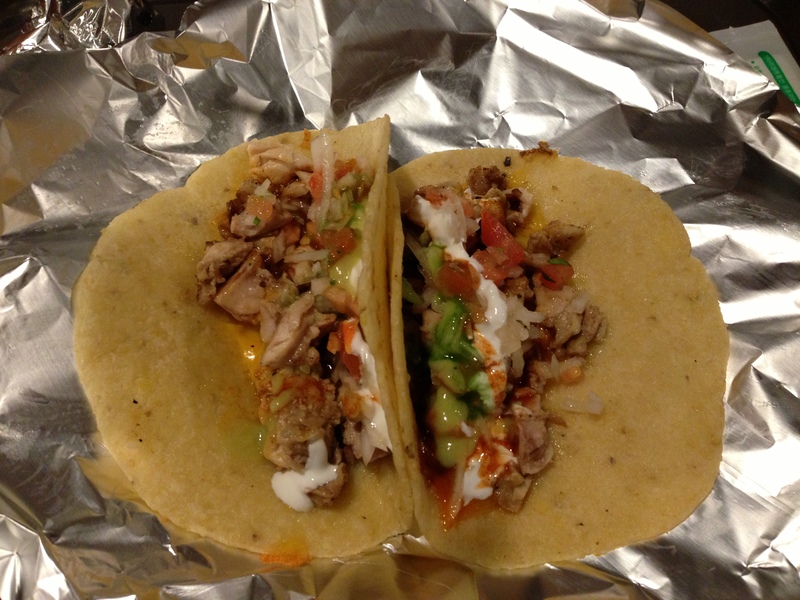 As for the grilled chicken tacos, they were great but not as amazing at the pork cilantro tacos. While the meat was delicious white breast chunks, it had the same ingredients from the cilantro pork tacos. The main difference between the two tacos beyond the obvious of having two different types of meat was that the chicken tacos let the supporting cast of condiments share the spotlight which resulted in a more even taste. A definite contrast to machísimo puerco tacos striding out across your palate like a proud matador who just dispatched an unlucky bull. Either way, I was thoroughly satisfied with my food and service. Posted in Latin American Cuisine, Tex Mex and tagged chicken, Hongdae, latin, Mexican, pico de gallo, pork, Seoul, tacos, tortillas. Bookmark the permalink.